At a technology executive gathering organized by the Wall Street Journal, Bill Gates acknowledged in public that Google is a leader in search business. The event was attended by executives from Sony, Apple, Yahoo and Disnet. Gates, on the other hand, wowed the crowd with humility about where Microsoft is lagging Google, with specifics about where Microsoft is going and even with the admirable reminder of his own heroic efforts to wipe out killer diseases. "This is one where there's more upside than downside," says Gates. He acknowledges that Google is the leader, but suggests outfits like Amazon's A9 search engine and Ask.com have done more innovating. 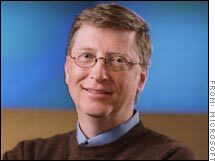 The writer calls Bill Gates a powerful senior statesman who knows his strengths and, surprisingly, his weaknesses.